Rather than having a list of resolutions for the new year out there (ok won't even try to put the usual weight loss or work out regimen on that list again), I'm approaching the new year with more of a theme, intention or philosophy that can help guide my actions and experiences. And while I like to think I'm generally a down to earth simple person though flashes of quirkiness and neuroses may sometimes come out, the simple act of striving for simplicity seems a lot harder than it presents. Though I like to think life is simple and I find beauty in simple things around me, the reality is life can be complicated. We are sometimes confronted with more to do lists than we can actually do (sorry this is not a post on mastering multitasking! ), more wants or needs, along with things that happen that are just out of our control. Throw in more sensory information like visual or auditory inputs coming at us from all different sources, whether from the internet, social media platforms (ok I know you're reading another long post), TV or our immediate surroundings. It can sometimes be hard to filter out all these stimuli in order to "just be"...to be content, at peace, to experience and enjoy the simple things around us and in life. This may mean different things to different people. But a way to apply this at least for me, is to just make a conscious effort to stop, unplug (okay will try to walk away from the computer now) and "be"....because as we all know, time just seems to go faster as we get older. And "where did last year go?" seems to be the typical question for the new year. 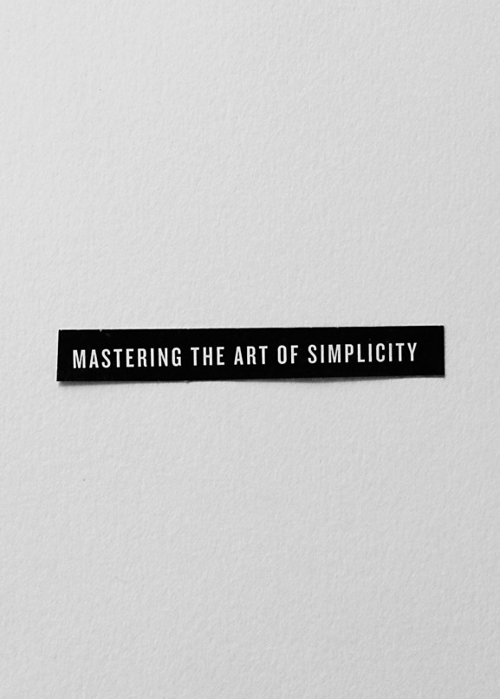 So whether it is mastering the art or even science of simplicity,applying this approach in my relationships and life means going back to basics by stopping and experiencing the simple things and moments of the every day. Okay, I'm sounding a little sappy...but could it really be that simple?